Casino Slot Machine! 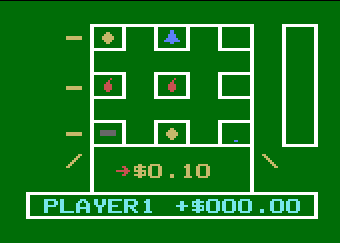 © 1980 The Magnavox Co.
Lady Luck is alive and well and living inside this authentic computerized simulation of the latest nine window one armed bandits. Enter your bets into the computer and pull handle. Free wheeling melons, bells, plums, cherries and the other traditional symbols spin by and fall into place one real at a tome. You can win (or lose) in five different directions on each turn. Fantastic party action! One to four people can play at a tome. Full sync sound action and the computer keeps track of the money!